Regardless of the test objective, solid state power converters take utility power as input and convert to the desired output power voltage, frequency and phase configuration. Single phase AC input configurations are by far the most convenient as any lab or factory floor will have single phase power outlets. In countries where 230Vac or 240Vac grid voltage is standard, this provides for reasonable available input power to support requirements of up to 3000W. For countries like the US or Japan where AC line voltage is only 120Vac or 110Vac, far less power can be drawn for a standard AC outlet. A typical 120Vac outlet only supports 10A so best case, 1200VA is available. This ignores possible low line voltage conditions that may reduce input power further. There are 120V, 20A outlet versions available in the US but there are not very common and use a different pin orientation so standard modular line cord plugs won’t work with these. For power output requirements higher than 1000W in the US, a split phase 240Vac or three phase 208V will be needed. Three phase power is typically used for higher power and industrial applications. Factory floors and power test labs typically have three phase outlets available. For office building, three phase power is used for lighting which is a big consumer of power so three phase power may be available in the building but three phase outlets may not. Higher voltages may exist in some countries (Canada) and Delta/Wye transformer may be used to change from Delta to Wye or vice-versa. Not all higher power AC or DC power sources have the same three phase input configuration. Pay attention to the type of three phase voltage configuration supported by the power source you are considering. If the input configuration is a Delta, the power source can be used with either a Delta or a Wye grid configuration. The neutral connection is not needed when connecting to the grid. Of course, equally important is paying attention to AC input voltage range. It has to match what is available at the location where the equipment will be used. While power factor corrected single phase input power sources often have a wide AC input voltage range, three phase products typically do not as the wide input current range requirement associated with that would be difficult or costly to implement. Some products however use AC input transformers which may support multiple voltage input transformer taps allowing re-strapping for different locales in the world. The drawback to this is that such power sources are typically quite a bit larger and heavier as a result. Since the AC input voltage is 230V nominal, we have to allow for operation down to 230V * 0.9 = 207Vac worst case. Not all power grids in the world are stable and low line brownout conditions can be quite common. At a worst case low line input voltage of 207Vac, this will require 3048 / (230* 0.9) = 14.724 A. ((10000 / (208*0.9)) / √3 = 30.84 A RMS per phase. This illustrates the impact of both power factor and efficiency on AC input currents and associated facility breaker and input wire sizing. In this single phase input example, the 15A input current is generally available on standard 230Vac outlets in Europe and other countries. 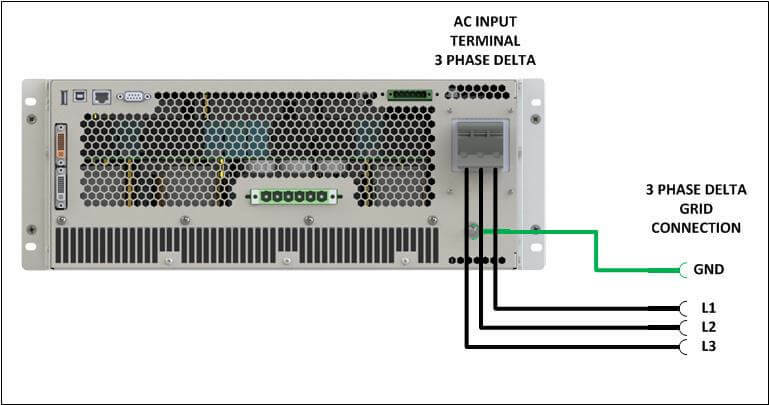 Once we need more than 2000W output power, we would either have to select a more efficient or better input power factor AC sources or consider using three phase input power. Let’s look at the two specifications that have the biggest impact on required AC input current, power factor and efficiency. While we covered required RMS input current to support full rated output power, we also need to pay attention to initial inrush current when a power source or power supply is first turned on. Since most input circuits consist of a bridge rectifier and bulk storage capacitor, initial current peaks may be high if the input capacitor is fully discharged. This may be true of power factor corrected input designs as well. To prevent nuisance circuit breaker tripping due to excessive inrush currents, make sure the power source is equipped with a soft-start circuit. Such as circuit uses a current limiting resistor or thermistor to limit the peak inrush currents while the bulk storage capacitors on the DC bus charge up. Once charged, this resistor is either bypassed or remains in a low impedance state if a thermistor is used. 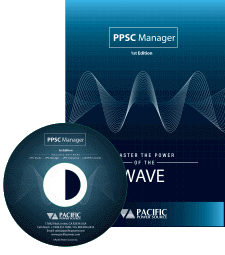 Pacific models with power ratings of 4500VA or higher all have soft-start circuits built-in. On lower power models, it is not always required but can be offered as an option. Passive PFC uses a line input inductor to compensate for any input inductance result in power factors that can be as high as 0.85. On three phase AC input designs, where the power factor without PFC can be as low as 0.6, the use of zig zag transformer can produce similar results. To get any higher, active power factor is required. For single phase AC input configurations, active power factor correction can reach up to 0.98 or 0.99 power factors under full load conditions. For three phase AC input PFC configurations, a PF of 0.95 or 0.96 is feasible. Note that input power factor specifications for power factor correction apply typically under full load. At less than full load, power factors will be lower but since the output power is lower anyway, this is not an issue. 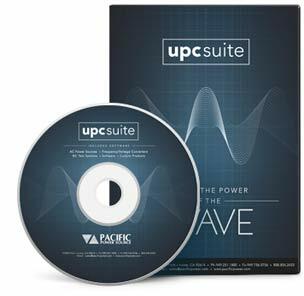 For higher power requirements, choosing an active power factor corrected programmable AC source like the Pacific AFX Series can save on facility wiring and installation costs. Efficiency is not as easy to improve as power factor. Since AC power sources need at least two power conversion stages to allow for frequency conversion, getting high overall efficiency is not trivial. Even if both power stages were 95% efficient, the overall efficiency would still only be 90%. If active PFC in used, this adds a third stage – let’s assume also 95% – and overall efficiency would be 85%. The example of 82% we used in this blog is not uncommon for AC power sources. DC power supplies use fewer power stages and can be found with efficiencies in the low 90’s. Understanding the AC input requirements of the power test equipment you plan to use will allow you to select the best configuration equipment that meets your objectives. Bringing in three phase grid power can be a costly proposition. At the same time, single phase grid power is typically limited in the amount of current and thus power is can provide. This is particularly true for the US, Mexico or Japan where single phase grid voltage is only 120Vac or 100Vac. The higher the power source’s efficiency and the higher its input power factor, the less input power is required to reach the desired output power demands. This also applies to three phase input power sources as it can avoid the need to upgrade your existing three phase power drops. When selecting a programmable power source, either AC and or DC, consider the AC input configuration and specifications carefully to help you choose the best solution.